A government commission advised Germany to shutter all its coal power plants by 2038 to cut greenhouse gas emissions and help Germany reach its reduction targets. This announcement will mean further upheaval to an industry already hit by the phase out of nuclear power. The commission provided a plan to shutter Germany’s 100 or so coal-fired power plants, eliminating 20,000 jobs and thousands more in ancillary industries, and shuttering almost a third of Germany’s coal plant capacity by 2022. The plan could mean a €1.2 billion ($1.4 billion) power station scheduled for completion next year would not be allowed to operate. Industries are concerned that electricity supply could become unreliable and prices could skyrocket. As a result, the commission advised the government to pay around €40 billion ($45.7 billion) to regions hit by the shutdown of lignite mines over the next 20 years to make sure new jobs are created. It also recommended that the government pay €2 billion ($2.3 billion) per year to compensate consumers and business for higher electricity prices, and an unspecified amount to indemnify coal power plant operators for the lost value of their assets. These are costs borne by the German taxpayer and in addition to the cost of the replacement capacity. These payments, however, may underestimate the final costs. Germany’s phase-out of black-coal mining between 1960 and 2018, when the last black-coal mine closed, cost over €240 billion ($274 billion). The German Chambers of Commerce and Industry estimate the cost of shutting down Germany’s coal power industry at €170 billion ($194 billion). Germany turned to renewable energy, primarily wind and solar, when it decided to phase out its nuclear plants by 2022 due to the Fukushima, Japan nuclear power plant accident caused by a disastrous tsunami in 2011. Now, Germany gets over 40 percent of its electricity from renewable energy, above coal’s share. 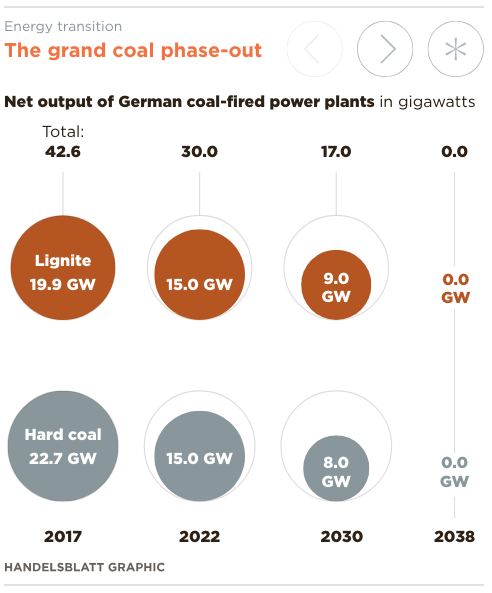 Coal-fired power plants in Germany currently account for about 42 gigawatts of generation capacity, and produce 40 percent of Germany’s electricity. The commission’s plan would reduce Germany’s coal-fired capacity to 30 gigawatts by the end of 2022 and to 17 gigawatts by the end of 2030. The shuttering of about 12.7 gigawatts of capacity by 2022 is equivalent to about 24 large power units. By the end of the next decade, the shuttered nuclear and coal capacity would be largely replaced by renewable resources, primarily wind and solar power, which would account for 65 percent of the generation. Some believe that the lost coal capacity would be largely replaced by imports of electricity generated from nuclear and coal power coming from Poland and Czechia. The commission also indicated that there is a chance that the phase out could be completed by 2035, but that should not be decided until 2032. According to the commission, compensation payments should apply to plants in operation and those that have not yet entered service or are still being built. Compensation could include capacity tenders or maintaining plants on standby, similar to existing reserve payments for operators that have totaled as much as 600 million euros ($686 million) per gigawatt. The majority of Germany’s population stands behind this exit from coal as long as the replacement is “reliable, affordable and acceptable for the regions.” German residential consumers already pay 3 times what U.S. consumers pay for electricity, although its industries are relieved of the additional costs because of fears that they would move manufacturing abroad. Unfortunately, the amount of renewable power needed to replace its coal plants without the proper back-up systems is not likely to be reliable, and certainly not affordable without taxpayer subsidies. Miners losing their jobs will also not find it acceptable despite the compensation and creation of new jobs suggested by the commission, and it is too early to tell what the overall economic impact of such a radical path might be.